Reading Jeff Kenney’s recent article in the Culver Citizen and The Pilot News about the new Lakehouse Grille in Culver brought to mind our involvement with the creation of its previous incarnation, The Edgewater Grille. The Edgewater Grille was already operating successfully when the owner/chef approached us about his plans to expand. As Jeff likes to say, “for those of you that remember…” the Edgewater Grille was started in the old Bait Shop, a small white building with an orange roof sitting on the site of the former bowling alley. (At that time the adjacent Lakeview Tavern was under separate ownership.) The Edgewater Grille sign only partially covered the old sign on the roof that said “BAIT”. There were only a few tables because of the limited space, but the business was brisk. The plan was to fill the entire site with a new restaurant, but keep the original restaurant open as long as possible in the interim. The owner had a vision of what he wanted in his head. With the help of Brent Martin, (B. A. Martin Architect, P.C.) we got that vision on paper and plans approved with the State. 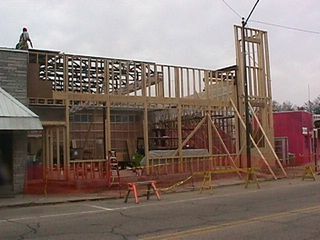 Part of this planning was to find a way to stage the project to keep the restaurant open. We accomplished this by phasing the project with the first phase including the restrooms, kitchen, mechanical rooms and some limited seating at the back of the site. As is etched in limestone on on the parapet, construction began in the Fall of 1999. 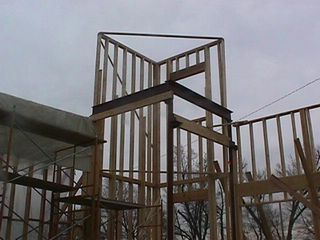 The structure was to be wood framed. This allowed for costs to be shifted and allow the bulk of expenditures on the kitchen and finishes. Exposed wood trusses were used to support a BMC CMR-24 roof. We showed various roof systems to the owner and explained the value of this system for the life of the building. It also allowed a low slope (1/4:12) roof pitch which maximized the interior space without requiring a height variance. BMC (Butler Manufacturing Company) has one of the best standing seam roof systems available in their MR-24 Roof. It uses a Pittsburgh double-lock standing seam with a full 360 degree seamed in place connection. The CMR-24 roof combines the MR-24 roof with rigid insulation board and liner panel to keep the interior clean. Look up the next time you’re there and you’ll notice a step in the roof. The step coincides with the transition between Phase I and Phase II of the project. The owner wanted a facade that reflected the community. 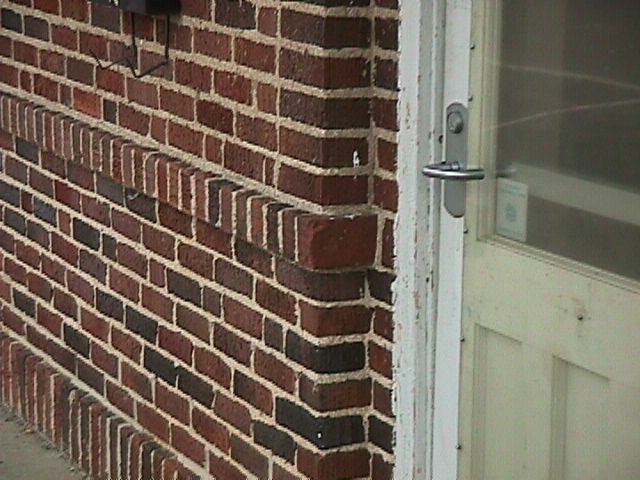 A brick was chosen that mirrored the brick used in the Vandalia Depot across the street. Even some of the details in the brickwork were duplicated in order to enhance that effect. As the facade was installed, the owner liked it enough to expand its use inside, creating a raised platform along the east wall. (It was removed during a subsequent remodel and replaced by a series of booths.) Mr. Martin proposed the tower on the corner to serve not only as an anchor to the structure, but as a metaphorical lighthouse tower since it sits at a bend in Lake Shore Drive. With the completion of Phase I, the restaurant closed briefly to allow the relocation of some of the kitchen equipment. 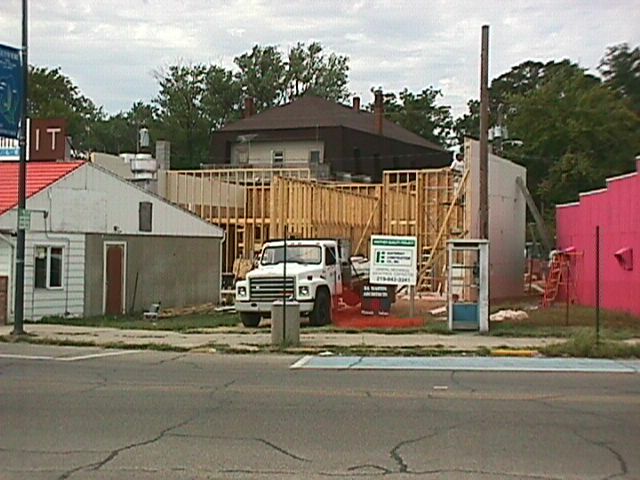 It quickly reopened in the new location and the old bait shop was torn down allowing the construction of Phase II to begin. Around the time Phase II was started, the old Lakeview Tavern was purchased, renamed the Lakeview Lodge, and combined with the Edgewater Grille. This allowed for additional seating while Phase II was underway. Phase II went through several changes as construction proceeded. One of the interesting things was the creation of the fountains found on the corners of the raised dais along the west wall. These were commissioned through Susie Black of Black’s Glass in Plymouth. We then added pumps and tubing to create a pool and waterfall effect. The glass was back lit creating a glittering cascade and occasionally a rainbow effect. Unfortunately the water was hard to control and the occasional splatter made them difficult to use when the adjacent seating was occupied. Variances were required along the way to accommodate the silver sign on the corner, the awnings and the entrance stairs and ramp. We also modified the sidewalk to create an accessible curb cut ramp. The restaurant was so popular that the Owner petitioned the Town to make changes and add a crosswalk to handle the pedestrian traffic from the parking areas across the street. All in all we were quite proud of our involvement with this project. We felt the building fit the restaurant and the restaurant helped usher in an era of fine dining in Culver which we were pleased to be a part of. "These words express my thoughts about what a great crew you all are. No wonder Richard puts his trust in your company."